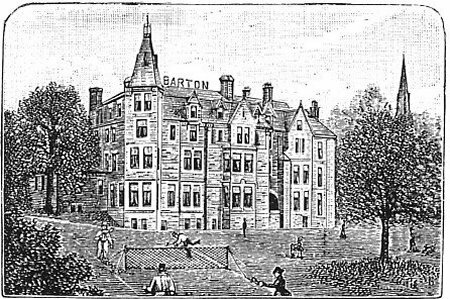 Drawn about 1890, showing the original BARTON, before it became DALEFIELD in 1906. Used in 1932. 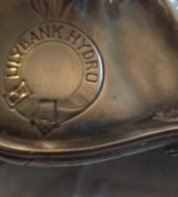 The final name was LILYBANK (from a Lilybank Hydro Ltd letterhead). 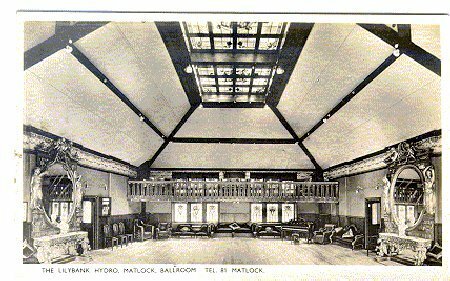 Lilybank Hydro, the Ballroom. Sent by Victoria Cambridge. (see her letter on right). The grand piano was presented to Mr and Mrs Kay by a number of Lilybank visitors, April 1923. The ballroom was 45 ft long, 34 ft wide, and 21 ft high, and was fitted with Morton's "Valtor" sprung floor. The gallery running the full width of the room, with piano, organ, and jazz drums, could seat 40. A bay window, 35 ft wide, extended into the terrace. 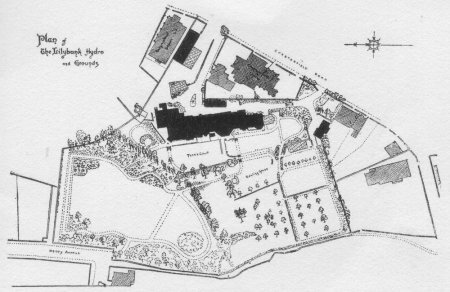 Plan of Lilybank Hydro, about 1923. Lunch:Scotch broth | Hot Roast Shoulder Mutton, onion Sauce or Cold roast Beef or Spiced Beef or Roast Lamb and mint sauce or Roast Veal and Ham or Ox tongue - Sweets:Canary Pudding or Rice and Semolina Puddings or Stewed Fruit and Custard | Cheese: Cheshire and Roquefort. 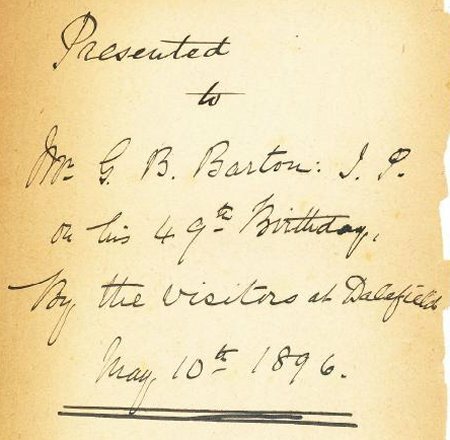 In 1890 George Barton opened a Hydro known as Dalefield, at the junction of Chesterfield Road with School Road. 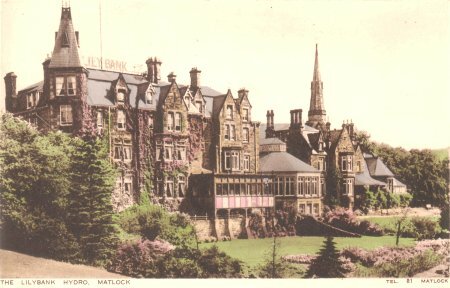 The name was changed to Lilybank in 1906, and was the last Hydro in Matlock to close in 1962. 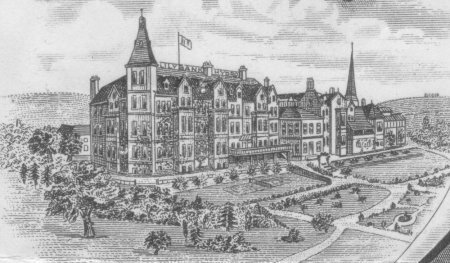 The building then became a convent school and later a residential home for old people. George Barton and his family can be traced in the following Census records: 1851, 1861, 1871, 1881, 1891 and 1901. I slept in many bedrooms over the 3 years I was there, most interestingly in the room on the third floor just below the "turret" (left hand side of the rear of the hotel) which by 1972 had been taken down (as it was unsafe) and had been lobbed off. The rooms were furnished in the old hotel furniture, with mahogany wardrobes - some very ornate and inlaid with compartments lined in green/pink water silk for all sorts of bygone items of clothing, such as gloves and sock compartments, stud drawers etc. There were the old turn of the century sinks in each room. The gables were very spooky and mostly used as music rooms (piano) - although there was one which was a small domitory which housed about 6 girls. The story went that the Gables were haunted by the "White Lady" - most girls rightly or wrongly were slightly afraid of the gables. The dining room was attached to the kitchen and again original - very Edwardian with a stained glass door and a huge (or it seemed that way for an 8 year old) oak dresser with a mirror overmantle. The "Day pupils Dining Room" was opposite the dining room and I think this had been used in past times as a lounge for hotel residents. 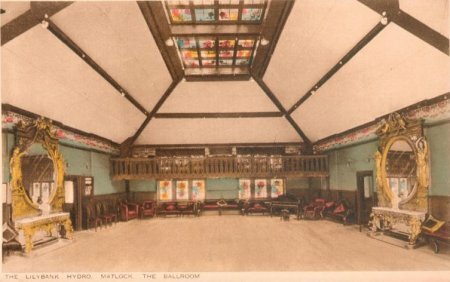 The ballroom was where was all played when the weather was bad - it had none of the furniture you can see in the postcard but had a wonderful wooden floor. The ceiling was stained glass with a simplist late art nouveau style glass. We used to set up the ballroom every Sunday morning for Mass - an altar underneath the band balcony and lots of little chairs with an isle up the middle. We also used to stage the annual Christmas nativity and plays celebrating St Patrick's Day. The Sun lounge at the rear was out of bounds to us girls but used by the nuns as their rest room - it was lovely in there in the few times I was invited in .... very cosy and had all the old hotel sofas and cane chairs in it. There was the original lift just inside the hotel (to the right) with the old gated doors. The basement over the hotel side was totally original - it was furnished with black and white tiling in it and I think this was where the "treatments" were given. We used it every day - as our coats were hung up down there and it was our way out to the grounds to play. Over the Gables side - the extensive cellars had huge windows overlooking the lawn terrace, and they were, painted half way up in a marroon gloss paint! As children when we misbehaved after lights out, we were sent down there for half an hour or so (in the complete dark and in total silence). It was quite sobering! 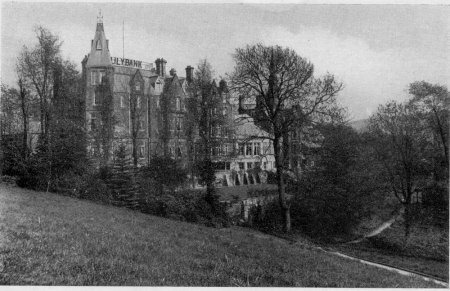 Lilybank is an outcome of the old and widely-known hydro, Dalefield, erected by the late George Barton.....Since the acquisition of Dalefield by the present proprietors this establishment has undergone a great transformation in many ways, until it now takes undisputed rank as one of the foremost institutions of its kind in the world-famed 'Metropolis of Hydropathy'. Since the purchase of Dalefield the proprietors, a year or two ago, acquired possession of the adjoining property known as The Gables, formerly occupied by Mrs Robert Wildgoose, to make room for the constantly growing demand for accommodation at Lilybank. Then, between the twin properties, they erected a new and very handsome structure, and designed thereon a modern ballroom, one of the most charming halls we have ever seen, brilliantly lit up by dozens of electric lights, and fitted with the popular spring floor, and luxuriously furnished throughout. This ballroom forms a connecting link between the two properties of Lilybank and The Gables, converting them into one large building. This the owners have surrounded with some beautiful grounds of very considerable extent. Within these spacious and well-kept are spaces for bowls and tennis, and these sports are freely indulged in by many votaries of the popular games. Then, inside, provision is made for the wet days when the company are prisoners indoors. Billiards, card parties, music, singing, dancing are all indulged in freely, and evidently immensely enjoyed. 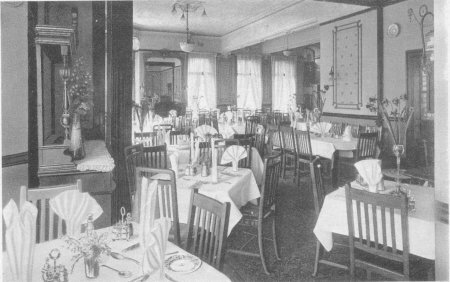 Meals are well and punctually provided, and the catering and cuisine are on most generous and satisfactory lines, and the attendance thereat exceptionally good. For the use of needy patients there are suites of baths for ladies and gentlemen, with competent and obliging operators. Sanitation is excellent, and perfect cleanliness exists throughout. 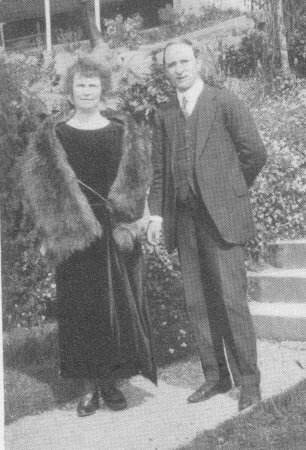 The manager and manageress of Lilybank around 1923. 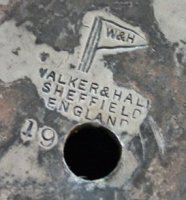 Pewter oil lamp 21" high, Lilybank Hydro c1906, made by Walker and Hall.